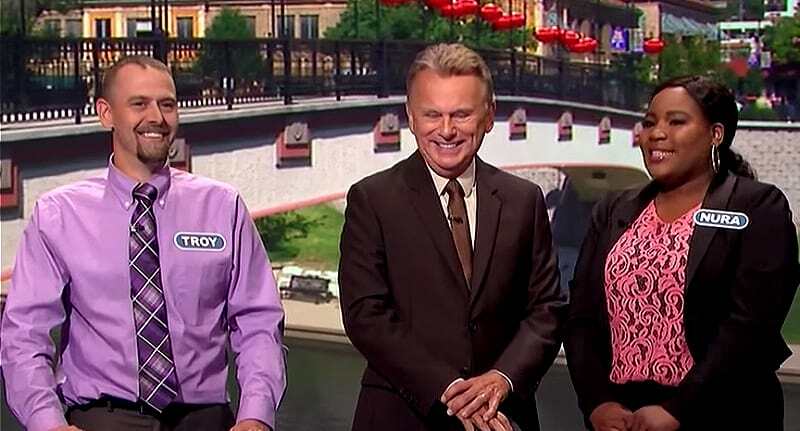 A game show contestant showed extraordinary generosity and quick-thinking when she rigged a puzzle live on air to share the prize money with a war veteran. Tackling the Wheel of Fortune, Nura Fountano found herself in the lead after the first four rounds. With just minutes left of the game – which was dedicated to war veteran past winners – she decided to purposefully halt her winning streak so that her fellow vets could take some money home too. In a round titled ‘What Are You Doing?’, the three contestants had to pick letters from the alphabet they believed would make up the two word phrase. While Troy and Steve were picking common letters, Nura faked confusion and chose the most obscure options. After a few rounds, presenter Pat Sajak clocked onto her game plan. When Steve finally reached the finishing line, guessing ‘Following footsteps’ was the correct answer, he and Troy had raked up thousands of dollars while Nura had added nothing to her existing total of over $13,000, which she had earned with her obvious intelligence in previous rounds. In a post-round recap, Pat pointed out that Nura had called some unusual letters in that round, to which she responded, smirking, ‘That’s what I saw’. Well, that was an unsatisfactory answer, but she’s not under oath, there is nothing I can do. But she is the big winner at $13,970. Fountano’s compassion meant that everyone could beat the Wheel and walk away a little more fortunate. The episode, which first aired as part of Veteran’s Week in November 2015, has since circulated on YouTube and recently resurfaced. Nura’s selfless kindness has gone viral all over again. These scenes just prove the unfaltering bond between war veterans.